To be clear, I love what Snyder and Capullo are doing with the book. I’d never read a Batman comic before this, and these two gents made me fall in love with both the character and the title. Almost all the stories that they’ve told till now have been excellent pieces of work and they’ve taken me along for a ride. But with this issue, confused as to what the overarching idea was, what the goal of this issue was. Because it interrupts the entire buildup of the super-storm and the Riddler going all villainy on Gotham. It appears to unnecessarily slow things down as well. I’m sadly left wondering if this script was rushed in any way because it lacks the typical storytelling finesse that Scott and Greg have developed over twenty-four issues prior to this. The story feels very disjointed. There are a lot of things that happen here. We first start off with a convoy of US soldiers in Nigeria on the lookout for something in the desert. What it is they are looking for, and why, we never find out, not even with the bookend final page. Then we switch gears to Gotham and see Greg’s redesign of the Batmobile for the very first time. Unless I’m mistaken, this is the first time the Batmobile has been shown in the New 52. My reaction: I am very underwhelmed. Greg gives us a slightly-side-view profile of the Batmobile in that first panel, and the hot-rod design kind of looks cool, but when we get the full side profile, its a disappointment. For me, the quintessential Batmobile is from Batman: The Animated Series. The funky tank that Christopher Nolan showed in his movies is also cool. This one however, is not. Its too sporty, too flashy. Not to mention, Snyder has the Batmobile do something really, really weird, the sequence of which I had trouble following the first four times I read through those pages. I am completely underwhelmed. Then we go to a murder investigation with Gordon where Doctor Pamela Isley makes an extremely brief cameo and we learn that there is a killer on the loose who can cause people’s bones to grow super-haphazardly. There’s some interesting dialogue here between Officers Gordon and Bullock, but the art largely detracts from the whole thing. The second half, with interactions between first Bruce and Alfred and then the duo and Officer Gordon, is much better. We even get a small glimpse of just why it is that Bruce hates Gordon so much, something to do with a cover-up or something of the murders of Thomas and Martha Wayne, Bruce’s parents. Nice little mystery going on there, something that will hopefully be dealt with in future issues. The scenes with Lucius Fox however felt a little forced, too much as if they were a necessary outgrowth of where the story was headed rather than something more natural and organic. Overall, the story proves to be rather middling. For many of the previous issues, I’ve praised Greg’s pencils, Danny Miki’s inks and Fco Plascencia’s colours. I can’t say the same this time unfortunately. The artwork is at times inconsistent and confusing. And there are too many colours involved in many of the scenes. It all starts to seem almost psychedelic after a while, like a strobe light show. The finesse, that’s what’s missing here. But holy hell we get some blimps in this issue, and blimps are awesome. Doctor Death, the big bad, has a nice look, but it all seems rather exaggerated and weird to me as a whole. The best pages in the entire issue are the ones that deal with Bruce and Gordon together on the Wayne estate. Soft colours with a minimal palette, just the kind of stuff I expect from all these guys. Being an extra-sized issue, there’s a backup in the end, this one dealing with Harper Row and her brother Cullen, characters we’ve seen on and off, first in Batman #12 after the end of the Night of the Owls arc, and then in the issues following the death of Damian Wayne, with Batman being a wreck. Interesting story, and decent artwork by Andy Clarke and Blond, but the story feels rather unnecessary, and doesn’t really help sell the whole Zero Year event. Following on from an issue as spectacular as Batman #24 was always going to be a pretty tough task. And I thought the team could very well prove itself yet again. But that’s not how things turn out here. 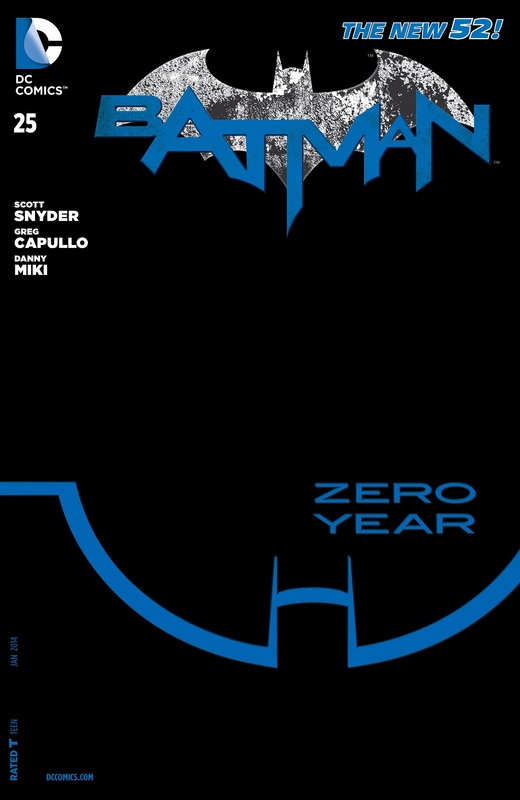 More Batman: #1-10, #11-12, Annual #1, #13-15, #16-18, #19-21, Annual #2, #22-23, #23.1, #23.3, #23.4, #24. Posted on November 13, 2013, in Comics Reviews, Review Central and tagged Andy Clarke, Batman, Blond, Bruce Wayne, Comics, Comics Review, Commissioner Gordon, Crime, DC Comics, Doctor Death, Gotham, Greg Capullo, Harper Row, James Tynion IV, New 52, Poison Ivy, Review, Review Central, Riddler, Scott Snyder, Superheroes, Zero Year. Bookmark the permalink. 7 Comments.